The fashionable communities of North Myrtle Beach provide a little taste of paradise. Stylish and informal, there is an easy blend of old and new. Restaurant Row offers 1500+ restaurant choices. Family fun is just a short drive away at Myrtle Waves, Cherry Grove Pier, Go Ape Treetop Adventure and much more. Or take in a show at the Alabama Theater. And who can forget about the more than 100 world class golf courses throughout the area! The typical beach bar with live beach music and fine dining at the country club co-exist in North Myrtle Beach. Whatever your passion is, you will feel at home here. 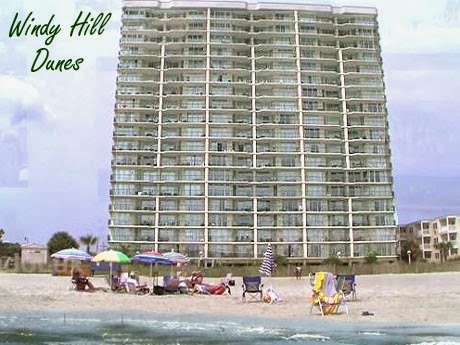 The spectacular Windy Hill Dunes Condos are a popular vacation choice. Vacationers and residents, alike, appreciate the added luxury and the more residential atmosphere. Located on the south end of North Myrtle Beach, this area is on the highest elevation which guards it against storm damage and flooding. These 3-4-5 bedroom condos are roomier than average with large private balconies offering stunning ocean views from living rooms, dining rooms and master bedrooms. There is a community outdoor pool, Jacuzzi, kiddie pool, lazy river, and fitness center to ease the tensions of the day and there is a grill area for family picnics. A covered walkway over the street leads to the parking deck. The Windy Hill neighborhood is close to Barefoot Landing with its 150+ boutiques, shops, entertainment, and restaurants and the 4 championship golf courses at Barefoot Resort. Joe’s Bar and Grill and the Olive Garden are nearby also. The new BiLo shopping complex offers a large grocery store, more restaurants and even a spa for your doggy! Whether you are looking for an investment rental property, a vacation home away from home, or something more permanent, Windy Hill Dunes has what you are looking for. 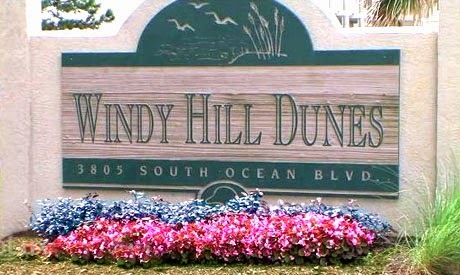 Call us today and let us show you the condos for sale at Windy Hill Dunes.